RAID 6 cannot be converted. By changing from RAID50 to RAID6 on a 12x600GB SAS unit, we can go from 4.1TB to 4.7TB, which will help get some free space and provide some extra life to this environment. 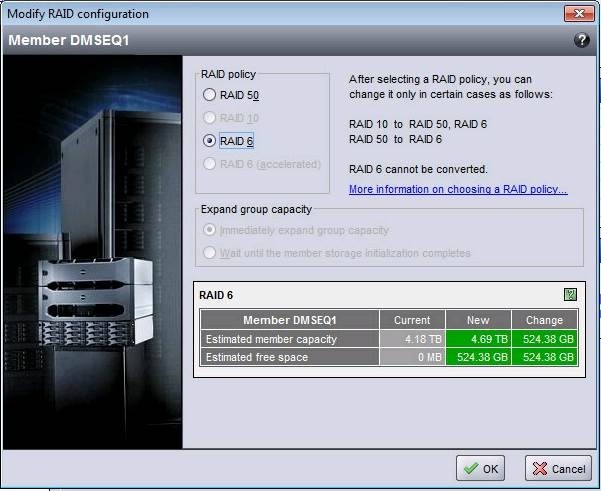 Note that the current RAID configuration is shown as “RAID 50” and STATUS=OK. 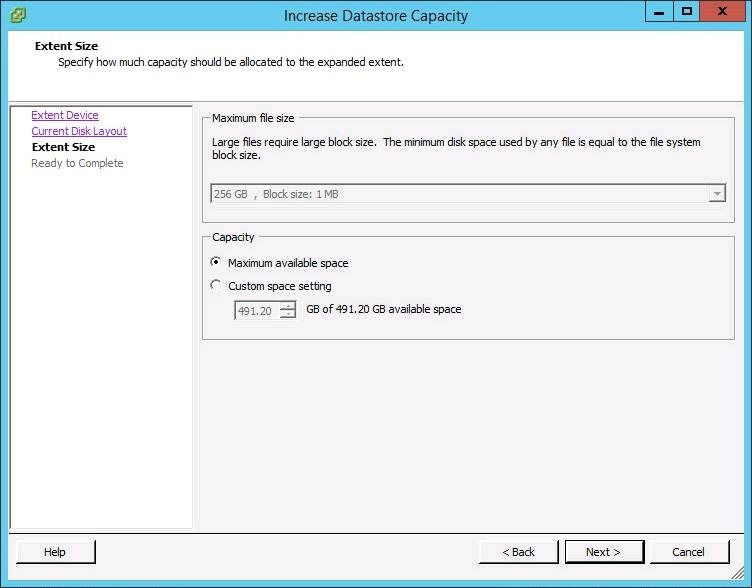 Note the change in space – from 4.18TB to 4.69TB, and a net change of 524.38GB, or about 12% extra space. Click OK.
After the conversion, the space will be available. Until then, the array status will show as “expanding”, as indicated. Click OK.
After about 7 hours, we’re at 32% complete. Obviously this is going to depend on the amount of data, size of disks, load on the array, etc. But we can sarely assume this will take at least 24 hours to complete. Understandably, you now need to use this space. It won’t be automatically applied to your existing Volumes/LUN’s, so you’re left with two obvious choices – grow an existing volume or create a net new one. As it is expected creating net-new is understood, I’ll demonstrate how to grow an existing volume. Select the volume you wish to grow. I’ll choose EQVMFS1. Click MODIFY SETTINGS and then the SPACE tab. Change the volume size accordingly. It does indicate what the Max (1.34TB) can be. I would highly recommend you reserve at least some small portion of space – just in case you ever completely fill a volume you may need to grow it slightly to even be able to mount it. Even if small, always leave an escape route. You are warned to create a snapshot first. As these volumes are empty, we won’t be needing to do this. Click NO. Note the volume size now reports as 1.3TB. 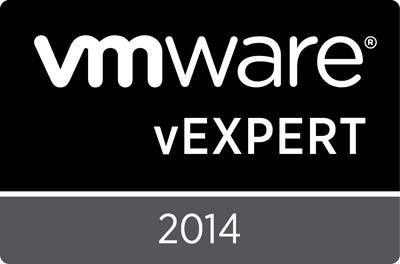 7) Next, we go to vSphere to grow the volume. 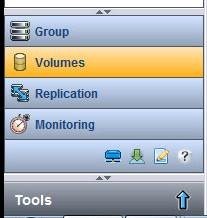 Next, once that completes (watch the Recent Tasks panel), select a host with the volume mounted and go to the CONFIGURATION -> STORAGE tab. Right click on the volume and choose PROPERTIES. 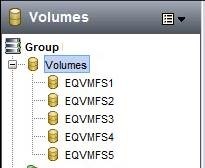 NOTE that in this example, I’m upgrading a VMFS3 volume. It will ultimately be blown away and recreated as VMFS. But if you are doing this, you will see warnings if you try to grow about 2TB, as it indicates. Click NEXT. 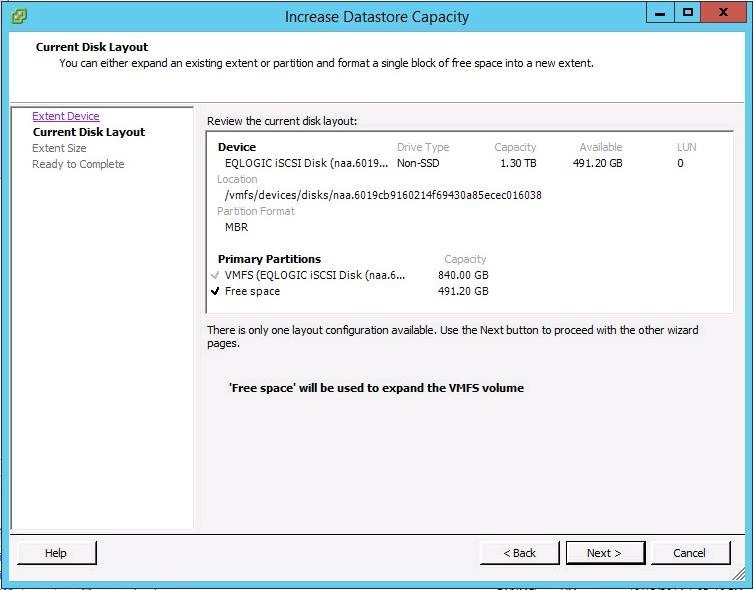 Here we can see the existing 840GB VMFS as well as the new Free Space of 491GB. Click NEXT. Choose the block size, if it allows you. Again, this is something you won’t see on a VMFS5 datastore. Click NEXT and then FINISH. You don’t have to do anything for this to happen. Changing RAID types will likely alter your data protection and performance expectations. Be sure you have planned for this. As noted before, once you go RAID6 you can’t go anywhere from there without a offload and complete rebuild of the array. If you hit the wall, and got back ~ 10%, this is your breathing room. You should be evaluating space reclamation tactics, new arrays, etc. This only gets you out of today’s jam. o NOTE: this is the Windows MPIO setting, and is typically only found if NetApp DSM is not installed. Setting both options ensures that in either case, 190 seconds is the corporate default. · INSTALL_*.BAT, INSTALL_*.LOG, and this VERIFY*.BAT/LOG location could be better standardized. For now, I am utilizing the default software share locations. Other flavours may result in an update to this document, if required. wmic product where "Name like ‘%%DSM%%’ and Version like ‘4.1.4348.1209’" get Name, Version | find /i "4.1.4348.1209"
wmic product where "Name like ‘%%NetApp Windows Host Utilities%%’ and Version like ‘6.0.4649.1236’" get Name, Version | find /i "6.0.4649.1236"
wmic product where "Name like ‘%%SnapDrive%%’ and Version like ‘7.0.3.6341’" get Name, Version | find /i "7.0.3"
REG query HKLM\System\CurrentControlSet\Services\ontapdsm\Parameters /v PDORemovePeriod | find /i "0xbe"
REG query HKLM\SYSTEM\CurrentControlSet\Services\Disk /v TimeoutValue | find /i "0xbe"
SRVD511 Thu 09/11/2014 17:16:07.26 – Data ONTAP DSM for Windows MPIO 4.1.4348.1209 – SUCCESS! SRVD511 Thu 09/11/2014 17:16:24.00 – NetApp Windows Host Utilities 6.0.2 6.0.4649.1236 – SUCCESS! SRVD511 Thu 09/11/2014 17:16:40.28 – SnapDrive 7.0.3.6341 – SUCCESS! SRVD511 Thu 09/11/2014 17:16:40.30 – Registry HKLM\System\CurrentControlSet\Services\ontapdsm\Parameters PDORemovePeriod at 190 seconds – SUCCESS! SRVD511 Thu 09/11/2014 17:16:40.31 – Registry HKLM\SYSTEM\CurrentControlSet\Services\Disk\TimeoutValue at 190 seconds – SUCCESS! SRVD513 Thu 09/11/2014 17:33:57.96 – Data ONTAP DSM for Windows MPIO 4.1.4348.1209 – NOT PRESENT! SRVD513 Thu 09/11/2014 17:34:11.03 – NetApp Windows Host Utilities 6.0.2 6.0.4649.1236 – NOT PRESENT! SRVD513 Thu 09/11/2014 17:34:24.07 – SnapDrive 7.0.3.6341 – NOT PRESENT! SRVD513 Thu 09/11/2014 17:34:24.12 – Registry HKLM\System\CurrentControlSet\Services\ontapdsm\Parameters PDORemovePeriod at 190 seconds – SUCCESS! SRVD513 Thu 09/11/2014 17:34:24.14 – Registry HKLM\SYSTEM\CurrentControlSet\Services\Disk\TimeoutValue at 190 seconds – NOT PRESENT! o NOTE: NO testing has been done for 32 bit OS, and no provisions exist in the current batch file. It is assumed that you are on an actual modern server OS, and it is x64. If not… perform the installation manually. · As this was intended for UPGRADES of systems with at least SnapDrive for Windows, we are assuming that the .NET 3.5 pre-requisite has been met. Additional work will be required in order to provide the error checking and installation processes for .NET 3.5, as each OS has a slightly different method of doing so. I’d recommend creating a standardized “INSTALL_DOTNET_35.BAT” that could be called by any other installation that requires it, to keep the process modular. · MSI LOG is to %TEMP% as %BATCH%.LOG, and is NOT cleaned up after installation. Use for troubleshooting. REM Enter the path to the installation folder – does not require quotes, quotes are assumed, with or without spaces – MUST not contain training "\"
REM MUST UPDATE THE SERVICE ACCOUNT and PASSWORD! REM waiting for each to complete before continuing. start /w "SDW_INSTALL" "%TEMP%\SDW.INST\SnapDrive7.0.3_x64.exe" /s /v"/qb SILENT_MODE=1 /Li %TEMP%\%~n0.LOG INSTALLDIR=\"c:\Program Files\NetApp\SnapDrive\" SVCUSERNAME=%SVCUSERNAME% SVCUSERPASSWORD=%SVCUSERPASSWORD% SVCCONFIRMUSERPASSWORD=%SVCUSERPASSWORD% IGNORE_COMPMGMT_RUNNING=1 SDW_WEBSRV_TCP_PORT=808 SDW_WEBSRV_HTTP_PORT=4094 SDW_WEBSRV_HTTPS_PORT=4095 TRANSPORT_SETTING_ENABLE=1 TRANSPORT_PRT_SELECTION=1 SKIP_HOTFIX_CHECK=1 ADD_WINDOWS_FIREWALL=1"
REG QUERY "HKLM\SYSTEM\CurrentControlSet\Control\Session Manager" /v PendingFileRenameOperations | find /i "C:"
SRVDC113B 11/09/2014 16:52:26.38 – NetApp SnapDrive for Windows v7.0.3 already installed! · Links to obtain the hotfixes are located in the Administration Guide, on Page 56. Links will have a HF # only, eg: “2796995”. These links may include downloads for multiple OS’s (eg: Vista/Windows 7 – equal to 2008 and 2008 R2), and each must be downloaded and located separately. These hotfixes will unfortunately be named such as “457359_intl_x64_zip.exe” for KB2796995. This is unfortunate as it is near impossible to correlate the versions and the files. I would recommend saving the files as “KB2796995-457359_intl_x64_zip.exe” with the KB######## as the prefix. Upon downloading, UNZIP the files in the same folder/folder structure, and you will note the final output of “Windows8-RT-KB2796995.msu”. You will quickly be able to tell if you have only downloaded one version if you see “Windows6.1” for a 2008 file and “Windows6.0 for a 2008R2” file, etc. wmic product where "Name like ‘%%NetApp Windows Host Utilities%%’ and Version like ‘6.0.4424.1239’" get Name, Version | find /i "6.0.4424.1239"
SRVDC217B Thu 09/11/2014 16:30:02.27 – NetApp Windows Host Utilities 6.0.2 already installed! SRVDC113B 11/09/2014 16:47:42.27 – NetApp Windows Host Utilities 6.0.2 has no previous version installed. o Links to obtain the hotfixes are located in the Administration Guide, on Page 56. Links will have a HF # only, eg: “2796995”. These links may include downloads for multiple OS’s (eg: Vista/Windows 7 – equal to 2008 and 2008 R2), and each must be downloaded and located separately. These hotfixes will unfortunately be named such as “457359_intl_x64_zip.exe” for KB2796995. This is unfortunate as it is near impossible to correlate the versions and the files. I would recommend saving the files as “KB2796995-457359_intl_x64_zip.exe” with the KB######## as the prefix. Upon downloading, UNZIP the files in the same folder/folder structure, and you will note the final output of “Windows8-RT-KB2796995.msu”. You will quickly be able to tell if you have only downloaded one version if you see “Windows6.1” for a 2008 file and “Windows6.0 for a 2008R2” file, etc. · You have been given the MPIO-WIN 14 digit product key from the NetApp NOW Licencing portal. 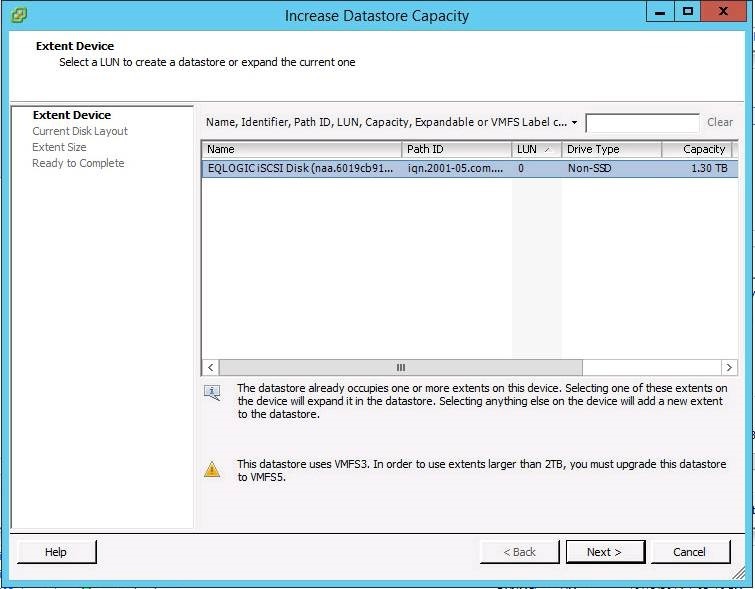 SRVDC113B 11/09/2014 16:46:13.13 – Data ONTAP DSM for Windows MPIO already installed! I was recently asked to perform SnapDrive upgrades against systems in preparation for a NetApp Data ONTAP upgrade. As I’ve been through this a time or two before, I knew it wasn’t quite as simple as “upgrade” SnapDrive. I figured I’d share some information that might help someone have a smooth transition when they do it as well. The first thing to do is check out the NetApp Interoperability Matrix Tool (IMT). This will help you determine all of the supported and required versions. These are the versions you’ll need to support Windows 2012 R2 and ONTAP v8.2.x 7-Mode. Next, you’ll need to perform an inventory against your systems to determine what versions or even if some of the above tools are installed. It’s not uncommon to find situations where SnapDrive might be installed, but the other tools may or may not be. Equally, the versions may or may not be what you’re expecting to find or standardized. Some of this will depend on who installed what, and when. Also, you’re likely to run into some older systems such as Windows 2003 or 2003 R2 that are running older versions, and have no upgrade path. So you may need to come up with a migration or lifecycle strategy for some of your systems. .NET 3.5 is required – likely, this already is, if you’re upgrading. If you’re installing clean, then it may not be present. Knowing what your ISCSI timeout settings need to be – my environment has been tested to prefer 190 seconds. I’ve tested these against Windows 2008 R2 SP1 and 2012 thus far, with no issues. With luck, I can help someone else’s upgrades go smoothly. For those that know me – this would be a GREAT place for an obligatory comment like “Ditch the LUN’s, VMDK’s don’t have this issue, and it’s time to stop living in a world with physical constructs, lack of portability, and vendor lock in.” I like NetApp products, but I like it better when it has VMware on top of it, and the Windows systems don’t have a clue! So I figured I’d start a new theme, which the title represents. This is “Lab Learning Lessons” or things you learn in the lab, that are better learned here than in Production somewhere. Hopefully this will help you out in the future, or if nothing else will reinforce for me that I’ve done this before. So with that in mind – this week’s lessons! 1) I can’t find the stupid ISCSI Target! Ever have one of those days? Setup a new SAN, configure the NIC’s, configure ISCSI, make some LUN’s, configure your Initiator Groups, and… nothing? 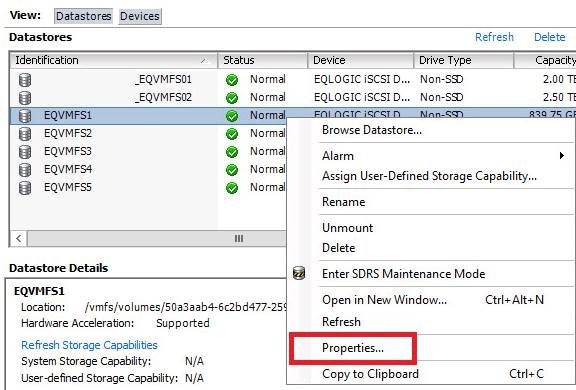 Add the ISCSI target to the Dynamic Initiators in the ESXi Software ISCSI Initiator and…. it never finds any Static Initiators like it should? So you try to do a “vmkping <target_IP>” and sure enough, THAT works. Worse yet, you do the SAME thing on the secondary NetApp (in this case) controller in that chassis, and IT works. So you’re doing the right thing. So you check against the OLD controllers – and your settings are similar as they should be. So you change the IP addresses on the Targets and… boom. It works. Lesson Learned: IP Address conflicts don’t tell you if the thing that is responding to your test pings is the device you WANT it to be. 2) Can’t vMotion VM’s. Or create a new one. Or create objects on a new datastore. Sounds strange right? The error includes “pbm.fault.pbm fault.summary” for everything you do. VM’s are otherwise working and doing what they should be. You can start, restart, reboot, etc. You just can’t move them around. A little Google-fu will suggest that you restart the vCenter Inventory and/or Profile Driven Storage service(s). Sounds reasonable. Except those take forever to do so. So you reboot the vCenter server, hoping that’ll help. No go. Then you open Explorer…. and realize your vCenter is out of space. Except all the services are quite happily started. No “Automatic” services are unstarted or failing to start. Nothing is tripping an error. It’s just “not working”. Lesson Learned: Maybe if you’re not going to use a 3rd party monitoring solution (eg: Nagios, ZenOS, PRTG, SolarWinds, etc), then you should configure basic Windows Scheduled Tasks to send e-mails when a drive gets to a certain used amount. Might save some stress. I’m big on having “predictable” IP Address standards. If you can, have “Primary” addresses be a x.y.z.1# and “Secondary” be x.y.z.2#, or some other system that works for you. Also if you have 4 NIC’s maybe the #’s in the previous examples should be the NIC #. So on a NetApp, e0c and e0d would be 3 and 4, so your IP would be x.y.z.13, x.y.z.14, x.y.z.23, x.y.z.24, or something else. The downside is you really need to be able to look at the final configuration, and work backwards. Are you going to do one IP per NIC? One per LACP/PortChannel? (Not so much for ISCSI, but for NFS/CIFS). if you do one for a virtual interface like an LACP vif – what # is it? It’s none of NIC 1-4 (e0a/e0b/e0c/e0d). Would you make it .10 and .20? Maybe. Or maybe .19 and .29, as it’s ‘odd’. What if you have a second unit in the same place? Is your solution scalable? The if your first pair of controllers is NW-SAN1 and NW-SAN2, and is .1x and .2x, then NW-SAN3 and NW-SAN4 could easily be .3x and .4x – but are you chewing up a lot of IP’s? Maybe. But in my opinion, it’s so worth it. Reading logs and troubleshooting becomes amazingly simpler, as you can now logically map one device to another by IP, hostname, port and NIC. Lesson Learned: Plan out as much as you can in advance. But if you can’t, try it in a simulator and work through your options. This is why they exist, and why we have labs.